Washington, D.C., March 15 – As the economy expands, for the first time in decades people with disabilities are gaining jobs, success and independence. According to new data, Nevada continues to have one of the nation’s highest employment rates for people with disabilities, outperforming bigger states like Texas and California. People with disabilities, who have previously been left out of periods of economic growth, are succeeding thanks to workforce system better aligned to enable them to succeed, just like anyone else. Last month, when America’s governors gathered in Washington for the National Governors Association meeting to talk about these and other key issues During the Winter Meeting, Governor Brian Sandoval took questions about jobs for people with disabilities in Nevada. 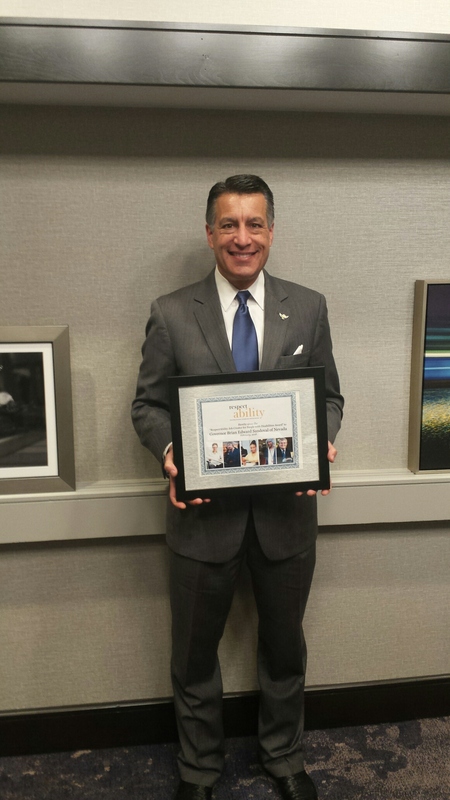 When asked, Governor Sandoval said: “I’m a person that has made that a priority. Out at Starbucks they’ve got a terrific program that has been really beneficial to people with disabilities and it’s something we want to replicate throughout the state.” He went on to add, “I’ve set some state policies with regard to the hiring of individuals with disabilities and will continue to do so. I’m hopeful that we serve as a model for other states.” During the meeting, RespectAbility took the opportunity to present Governor Sandoval with an award in recognition of job gains for people with disabilities in his state. According to RespectAbility, a national organization that fights stigma and advances opportunity for people with disabilities, Nevada now ranks 13th on jobs for people with disabilities. In total, there are 198,826 working-age people with disabilities living in that state and 83,453 of them have jobs. With a 42 percent employment rate for its people with disabilities, Nevada now outranks most states in the country as a place for people with disabilities to be employed. RespectAbility, like most governors and employers, emphasizes the critical link between education attainment and workforce development. “Employment rates only tell part of the story,” said Philip Kahn-Pauli, Policy and Practices Director at RespectAbility, “Educational attainment is critical to the success of youth with disabilities because the jobs of the future require technical education and skill training.” Nevada had an overall high school graduation rate of 73.6 percent in 2016, but only 29.3 percent of the students with disabilities graduated. That puts Nevada students with disabilities behind other minority students who graduate high school at higher rates. View data on all states:New Jobs for People with Disabilities, 4X the Previous Year – 343,483 new jobs for people with disabilities!